A Room with a View ~ Android Forever! Take a minute and look around. Go ahead, look away from your monitor for a minute. To your left, to your right, behind you. What do you see? The same boring stuff you see every day, right? The same boring people, the same boring furniture, etc. Do you have a window where you are? What's the view like? A parking lot with a dumpster? A stupid tree? I feel your pain. Sometimes you just want to look at something else, somewhere else, even if it's someone else's boring view. It's new to you, right? Here's a way to take a break from the things you have to look at every day. Check out someone else's world for a few minutes, then come back to your own, and you feel refreshed and ready for anything. Well, maybe not that refreshed, but maybe enough to get you through your day. 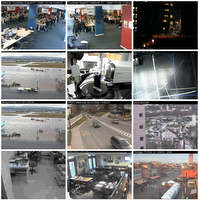 Visit Opentopia, a site that boasts "random live webcams from the net." Click here to get away from your life for a short break.